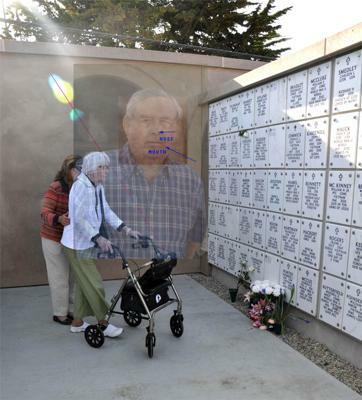 While visiting at Ft. Rosecrans military cemetery, these orbs showed up one photo only. My father passed away on January 3, 2012. He was one week short of being 93 years old. He was a retired naval aviator (dive bomber in Battle of Midway (won Navy highest medal, the Navy Cross, for flying so many missions in that fight. He also received a Purple Heart in another battle six months later (shot down in the South Pacific.) My mom is 94 (in photo). They were a little over one month short of celebrating their 70th Anniversary, and they had fallen more in love in the last two years than ever before. Dad passed away in a split second of heart failure, and had his head in her lap while they were trying to get into the car on their way to a doctor's app't. This photo was taken at Ft. Rosecrans Memorial Cemetery for military in San Diego, CA. He was cremated and remains interred at photo location. It is on a beautiful strip of land called Point Loma that looks over San Diego and Mexico looking left. This was our second visit (March 4, 2012) after his memorial service on Friday, February 17. It was taken about 3:20 p.m. shot facing north. The weather was beautiful that day, sunny. Other photos taken in same location did not show orbs of colored light. I also felt like I could see pieces of dad's face, and then I realized that it looked like the photo that was used in the local newspaper. (I have a series of photo that I did overlays on in Photoshop. The photo uploaded is the exact original of photo - nothing altered in Photoshop. We also have been experiencing lights be turned on and off, the car security system going off at 11 p.m. (honking in garage), etc. We wanted to find out if the lights could be true orbs, which I just read about this evening. I tried very hard to have my dad open the door to God before he died, but I am not sure if he did. I feel like the signs we are receiving are his way of watching over my mom to make sure she is okay. I also said prayers asking to receive signs if it was in God's Will. I like to read haunted stories and articles like this.That's why i came to this website to read like these articles.This article is about Brightly colored orbs displayed Mausoleum and i am really enjoying reading it. Hey Bobbie, very sorry to hear about your dad's demise but remember that only those who donot associate a partner with God will go to heaven. This is a full and final rule and no one should dare break this rule. I believe you. I have pictures of colored orbs that were taken after midnight. Try to tell me that it was the sun.